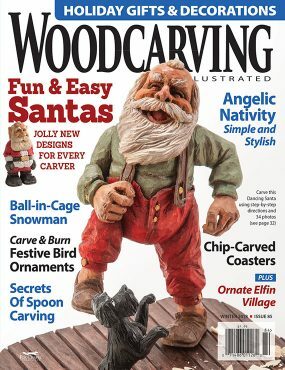 I love to carve Santas and get many questions about how I paint my carvings. I believe painting is a separate skill, and you need to put as much effort into learning how to paint as you did with carving. The more you paint, the easier it gets and the more confidence you will have to play with the colors. Alternate Colors: Don’t be afraid to use red values other than the classics. Try mixing several to come up with your own shade. I stay away from the traditional Christmas reds; they tend to be brighter than I like. Substitute purple madder for dioxazine purple, tangerine for cadmium orange, or Delta Ceramcoat AC flesh for skin tone base. Hiding a Dark Streak: Wood can be unpredictable. On one ornament, a dark streak emerged as I carved. It looked fine on most of the carving, but weird where the streak went through the teeth. To hide the dark spot, I applied two coats of gesso to the teeth and then painted the teeth with full-strength paint. Brush Care: I don’t have a preferred brand of paintbrush; use what you have and like. However, always clean and reshape your brush after each use to prolong its life. Choose small brushes, like the 18/0 I use for eyes, carefully. You want a fine, tapered, smooth tip. Metallic Paint: Careful application of metallic paints, such as the tooth on the Santa above, can accent a piece. I use JoSonja metallic paints because even when you thin them to paint lines, they still retain their glimmer. For a shiny gold, apply a base coat of red. For a shiny silver, apply a base coat of blue. Larger Ornaments: Not every ornament needs to be sized to fit a tree, especially since the smaller the carving, the harder it is to paint. Bump up the size to make it easy to carve and paint. Then, use a keyhole bit to carve a slot in the back, or attach thin wire to two screws on the back of the carving to hang it on a wall. Sign your Name: Carve your name and the date with a V-tool or micro gouge, add it with a woodburner, or use a permanent marker before you dip the carving in the oil mixture. It is fun to go back and see where you started and how far you have come. 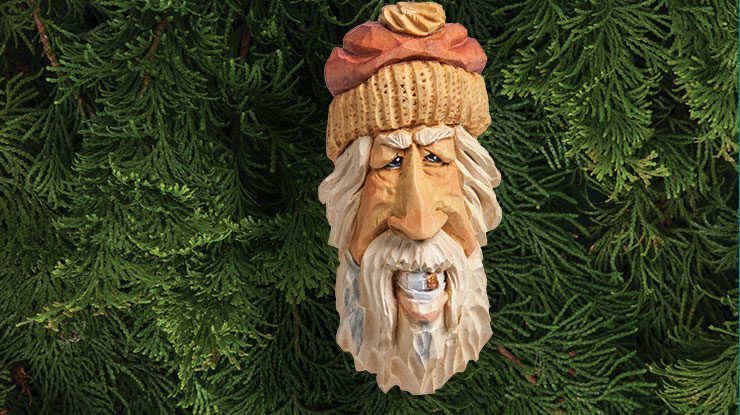 Download the Gold-Tooth Santa pattern HERE. Carol Leavy lives in Iowa with her husband. She has three sons. 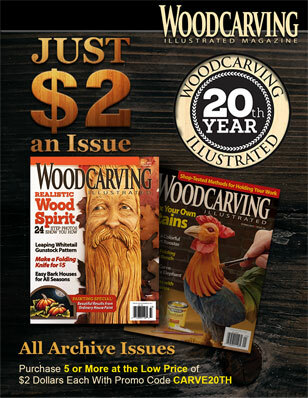 Carol got serious about carving in 2008 after taking a class with Mike Shipley at the International Woodcarvers Congress. 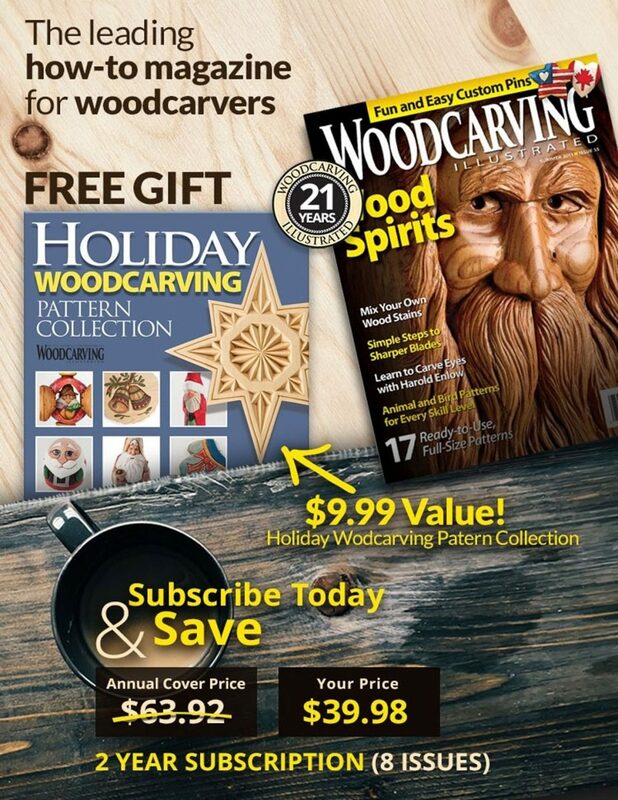 She’s a member of four clubs in the Midwest and is a past president of the Affiliated Wood Carvers.